On our last night, we all said that we regretted that we did not have the opportunity to see the Coliseum. 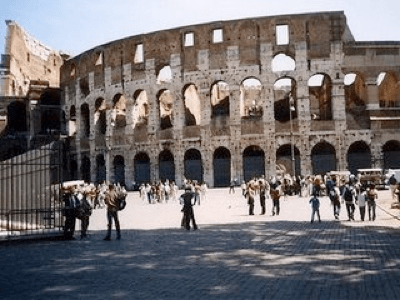 How could one visit Rome without visiting the Coliseum? It would be an embarrassment, right? It was already nightfall, the Coliseum was closed, the streets were rather empty, and it was just about time to find a good take out place for pasta and a bottle of Chianti to share. I don’t know exactly which one of us had the idea, but we came up with a mischievous plan. We were going to break into the Coliseum. From the picture above you can see that there are iron gates to the right that are rather high, but they do have two crossbars that make scaling the gate doable. So with hearts jumping out of our chests and risking time in an Italian jail, all four of us jumped the gate. With a lift up from Chandra, the 1st over was Katia, a very thin and spry woman, then Nadia, I went 3rd figuring I better go because without the help of Chandra, I didn’t know if I could have lanced my short body over. All in, we mazed through the dark hallways to get to the center of the Coliseum. It was absolutely majestic with the light from the moon. The shadows playfully created a more accurate picture of what it was in its day…I could imagine it filled with water with boats engaging in war or gladiators and chariots fighting for their lives in front of cheering spectators and the emperor. Of course, we did this all in complete silence as to not alert the guards that were walking around frequently with flashlights. However, our luck ran out after about 15 minutes, when one of us (who will remain nameless) took a picture with flash and alerted one of the guards to investigate. We hurried to get back to our escape route trying to be as quiet as possible. This time we were all so scared and hurried that there was no need for Chandra. We all made it over the gate without the help of a boost; the adrenaline was enough. So just by a fraction of a moment, we could have been spending a night in a Roman prison. I guess it would have been a good compliment to Christmas Eve in a Turkish Brothel, but I am glad it didn’t happen that way. I wouldn’t suggest breaking into the Coliseum, but definitely don’t leave Rome without seeing it. However, if you must scale the walls or jump the gate, it is unforgettable and without the hordes of other tourists. As a recommendation, wear dark clothes, running shoes, and do not take flash photography. I have noticed yr comment “So just by a fraction of a moment, we could have been spending a night in a Roman prison. I guess it would have been a good compliment to Christmas Eve in a Turkish Brothel, but I am glad it didn’t happen that way.” and of course I laughed. I am sure your pants have not taken to Turkey, and even if so not to the place you have mentioned. But your Turkish friends want you know: we in Turkey are tired of being associated with stuff like this. Pls pay us back next time with a comment ” his/her eyes were so beautiful, like the Turquise colors of the Turkish seas ” or similar. I look forward to traveling to Turkey again soon. Little did I mention that Turkey is one of my favorite destinations. During my stay, I visited Istanbul which is majestic. Also, I explored Cappadocia which also was historical, unique, and just interesting. I certainly am glad that I now have many Turkish travel experts. I will take the opportunity to revisit and see the Turkish seas, beaches, and repeating some of the first visit that are my favorites.